Forty years ago, Marge Burba revved up her Cougar station wagon each morning to pick up five older adults and bring them to her two-story home in Olney, where the living room and kitchen were turned over to them as part of a program meant to keep them engaged during the day. At a time when a sociological theory that withdrawing from society was both natural and acceptable late in life — thus a time when many older adults were being plopped into unenlightened nursing homes — Burba was gathering practical proof of her thesis for a master’s degree in gerontology from Antioch University’s Columbia branch. Her program looked to psychologist Erik Erikson’s theory of ego integrity, which said that when growth is denied to older persons, despair takes over. A single mother of two, Burba used her own financial resources to fund her model for the program, which she called Winter Growth (“winter” for the last phase of life, “growth” for the continued potential for older adults). The program offered counseling and activities to the participants in Burba’s home. When the number of people kept growing and soon reached 19, she found a new meeting place in a Sandy Spring community center. In those early days, which Burba called “the honeymoon years,” she did the cooking, the driving and the overseeing of the programs. Today, four decades later, some 300 older and disabled adults are participating in programs at Burba’s Winter Growth centers, now located in Columbia (at the Florence Bain Senior Center) and Olney. Besides day programs for older adults, the centers offer assisted living and respite care programs, all overseen by 85 full- and part-time staff members. Burba has always shown dedication to helping others. Her undergraduate degree was in child and family development. She taught first grade for four years and consulted for Head Start Programs. After moving to Maryland, where her two sons were born, she started a nursery school and day care center in her own home. Her career interest then moved on to older adults. “Human development through the entire life cycle has always interested me,” Burba said. 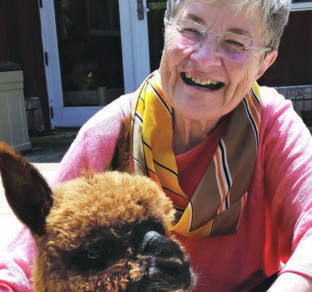 Now 76 and “sort-of retired” (she still visits the centers and keeps up with the programs there), Burba puts it this way: “Older adults…need the opportunity to continue to live true to the persons they have already become. Burba has certainly followed her own advice, preferring meaning over money. “I’m not, and never was, in it for the business,” she said. The newer staff members, Burba said, “have the passion and determination that we had in the early days of the organization. Some of the adult day programs offered at the Columbia and Olney centers include: age- and health-appropriate exercises; nutrition updates; musical programs (e.g., tributes to Dolly Parton and Barbara Streisand); “brain-training” through question-and-answer sessions; bingo; current events discussions; get-togethers with others who have had similar work and military experiences; movie time, and outings to, among other places, nature sites, the library and Walmart. Winter Growth also offers assisted living facilities (32 bedrooms in two buildings in Columbia and 16 bedrooms in a building in Olney). Burba noted that the residents there are offered family-style living, nursing assistance and medical monitoring and support. Respite care programs are also offered by Winter Growth. These programs enable non-paid older adult caregivers to take short breaks from their duties of taking care of others. Columbia resident Margaret S. Edwards, who just celebrated her 87th birthday, takes part five days a week in the Winter Growth day program. April Tayman, who also lives in Columbia, has seen three members of her family attend Winter Growth facilities. “It started 25 years ago when my great aunt came to live with my parents. She started to take part in Winter Growth programs. Then, 10 years ago, I started taking my father to the center. The fee for Winter Growth’s day program is $91 per scheduled day visit (including two-way transportation, meals and activities). Medicare does not cover the cost of Winter Growth programs. However, persons on Medicaid who have qualified for the “waiver” that allows expenditures for community services may use those funds for Winter Growth. The price for the assisted living community ranges from $58,999 to $68,000 yearly, and fees for the respite program range from $18 to $22 an hour. Guidelines for nominations, which can be made until March 31, are available on the website: wintergrowthinc.org/fabulous-40-nomination-form. For more information on the events and about programs at the center, call (410) 964-9616. Burba offered a quote from the late French writer Albert Camus that has become her philosophy and, she hopes, will be adopted by the participants in her Winter Growth programs.